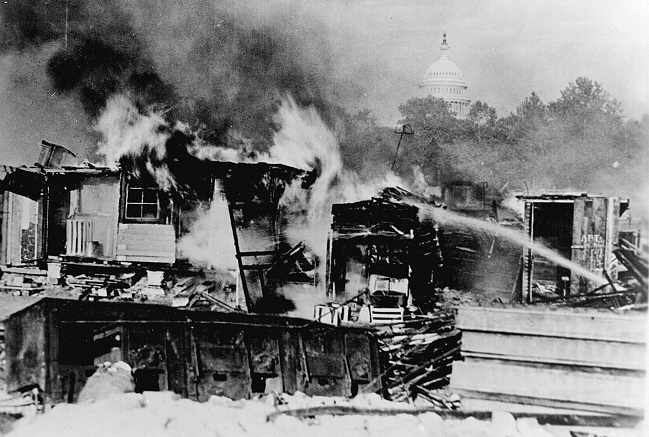 Shacks put up by the Bonus Army on the Anacostia flats burning after the battle with the military, with the Capitol in the background. Taken by a Signal Corps photographer, July 28, 1932. Courtesy of Wikimedia Commons. As banks failed, unemployment worsened, and desperation deepened during the early years of the Great Depression, marches and protests became commonplace. John Dos Passos covered several of them for The New Republic, and his 1934 collection In All Countries gathers some of the accounts as “Views of Washington.” In these impressionistic sketches, he describes the Hunger March outside the Capitol in December 1931, political machinations in the halls of power during the winter and spring, and the “Bonus Army” phenomenon the following summer. Officially calling itself the Bonus Expeditionary Force, the Bonus Army was composed primarily of World War I veterans and their families. In 1924 Congress had passed a bill to compensate combat veterans, most of whom received certificates redeemable upon their deaths or in 1945, whichever came first. By 1932, unemployed veterans could no longer wait for their “Tombstone Bonus,” and Walter W. Waters, a former Army sergeant in Portland, Oregon, led a group of men who hopped freight trains to the nation’s capital. By the time they reached Washington in May, word of the protest had spread and tens of thousands of supporters camped in Anacostia Flats and other areas in the northeast quadrant of the city. What happened next is etched in the American memory: for the first time in the nation’s history, tanks rolled through the streets of the capital. MacArthur ordered his men to clear the downtown of veterans, their numbers estimated at around 8,000, and spectators who had been drawn to the scene by radio reports. At 4:30 p.m., nearly 200 mounted cavalry, sabers drawn and pennants flying, wheeled out of the Ellipse. At the head of this contingent rode their executive officer, George S. Patton, followed by five tanks and about 300 helmeted infantrymen, brandishing loaded rifles with fixed bayonets. The cavalry drove most pedestrians—curious onlookers, civil servants and members of the Bonus Army, many with wives and children—off the streets. Infantrymen wearing gas masks hurled hundreds of tear-gas grenades at the dispersing crowd. The detonated grenades set off dozens of fires: the flimsy shelters veterans had erected near the armory went up in flames. Black clouds mingled with tear gas. As historian David M. Kennedy concludes, the event “marked the lowest ebb of Hoover’s political fortunes. . . . He was already a beaten man.” The episode was the final blow for the incumbent president’s reelection campaign, and it undoubtedly contributed to Franklin D. Roosevelt’s landslide victory in November, in which Hoover carried only six states. 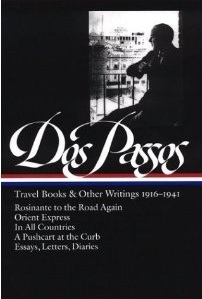 Notes: Dos Passos’s account contains several references to political events and politicians of the early 1930s. Charles Curtis (p. 396) was the Vice President under Herbert Hoover. The mention of two contested seats on page 397 refers to two contested Senate elections in North Carolina and Alabama. In Alabama, J. Thomas Heflin, first elected as a Democrat in 1918, was defeated in 1930 when he ran as an independent, and the Senate ultimately rejected his election challenge. John Nance Garner was elected Speaker of the House in 1931 and would be Vice President for the first two terms of the Roosevelt administration. The W.C.T.U. (p. 398) is the Woman's Christian Temperance Union. The A. F. of L. is the American Federation of Labor; William Green was its president from 1924 to 1952. Brigadier-General Pelham D. Glassford (p. 399) was the District of Columbia police chief. William Weinstone was a leader of the Communist Party of America. Passages at the top of page 401 mention how in 1931 Hoover arranged a one-year moratorium on the payment of international debts, while Congress established the R.F.C. (Reconstruction Finance Corporation) to make loans to financial institutions and railroads. CC pills (p. 402) are compound cathartic pills, used for digestive ailments. Washington has a drowsy look in the early December sunlight. The Greco-Roman porticoes loom among the bare trees, as vaguely portentous as phrases about democracy in the mouth of a southern senator. . . . If you don't see the full story below, click here (PDF) or click here (Google Docs) to read it—free! Dos Passos was an insightful and imagistic writer. The termite imagery was brilliant. This was an excellent selection because it revealed a period of American history/economics/politics/social conditions that I was admittedly unaware of. With the Dos Passos account and your introduction, I've been educated. That feels good. My understanding is, according to progressive Historians such as Charles A. Beard, history, once the wheat has been separated from the chaff, leaves Scholars with what has been called the "usable past". What Dos Passos tried to do in researching in order to write U. S. A. was to do the work of that separation.